Japanese and Dimensions | Mezashite! Ok, so I can see why this was hard to understand. It requires context from the entire second half of the episode, and there were many distracting parts involving very lewd high school girls and something strange happening with the laws of physics. So lets start from the beginning. Haruka and Yuu are shown coming back from the convenience store during their lunch break, and are talking about strange flavors of Pokitz (like salad). That part is important. Meanwhile, we see Yuzu and them start talking about wanting to eat “yakisoba” for lunch. They introduce the fact that you could misunderstand what exactly she wants by comparing yakisoba bread and “cup” (or instant) yakisoba. To make the latter, you need to add hot water and wait for 2-5 minutes for it to cook and warm up, which is why Kotone keeps bothering Shizuku about that. At this point, you should already have in mind that there are several ways to interpret “yakisoba”, and we have been shown two of them. The joke concludes with Yuu having bought yakisoba flavored Pokitz, a far cry from anything Yuzu was expecting. This can be interpreted in several ways. First, if you take it from an abstract point of view, you can realize that it goes back to the entire talk about what yakisoba actually is. Normally it is a food you eat from a plate or bowl, but due to convenience and increased mass-production of goods, it was put into a “cup” form (this includes every type that you pour hot water into). This was taken one step further from the original to make the so-called “yakisoba bread”, which is even more convenient (to say nothing of the flavor). Taken one step even further (one more dimension outwards, so to speak), they isolated the yakisoba flavor and turned it into a snack food. Taken from an absurdist /literal perspective, Yuzu and Kaede were expecting something round, either in the form of a cup or a bread roll. Yuu presents them with a box, which is flat. There is an inherent irony and humor in how far gone the Pokitz is from the original. And yes, I know that going from a cylinder shape to a rectangular prism isn’t literally losing a dimension. It requires some flexibility of mind to understand. Sorry about the 4-5 typos we made, the first episode of new anime usually has problems just from being something new and also the excitement that comes with doing something fresh. #evetaku, it was TBS’s fault for moving the advertisement to the bottom right this season. To the guy who can’t understand v01.5: whatever man. This entry was posted in Rants, Sakura Trick by Akatsukin. Bookmark the permalink. Well, Pokitz are sticks, which are sort of one-dimensional. I am no expert in Japanese, but I don’t think this works on an English or a Japanese level. Pocky sticks are (sort of) one-dimensional, but it’s still a really obtuse joke. More importantly, I don’t think that’s what the line was saying… the remaining relevant piece of context that you didn’t mention is that the girl was chanting “Cup! Cup! Cup!” right before (as she was the one guessing they would bring back yakisoba cup noodles). I am guessing the meaning was more like, loosely, “What planet is this?”. although it really only works in Japan since they have the snacks that are the flavor of actual foods. Of course, that’s funny in and of itself as well, in addition to someone picking it out as a lunch for someone who requested “Yakisoba”. 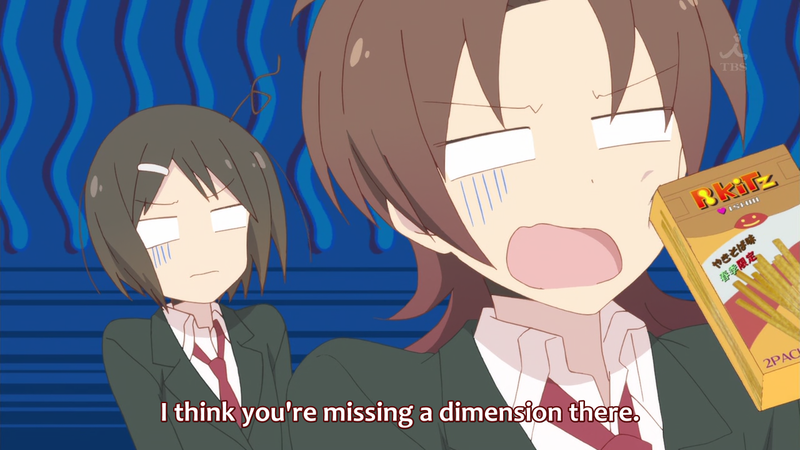 The use of “dimension” might be confusing to some people, but as long as you get how far removed the snack is from anything Yuzu and Kaede were expecting, even cup noodles, it works. Guess it helps to know that the “food” flavors of snacks are still funny/weird to Japanese people, too, and humor like this pokes fun at one of the possible (but absurd) consequences of the existence of food-flavor snacks. Come on man, I thought you were better than this. My two cents: I think something more along the lines of “That’s a level lower than even a cup” would work better, but the whole thing can be understood on context regardless of the wording. ooh i see ^^. I rarely hangout on irc so I didn’t know any of this, thanks a lot for the info! How autistic do you have to be to not understand this joke? While Yuzu and Kaede expected Yuu could buy a yakisoba bread or a cup yakisoba. They are different but that is still not completely. For instance, you can make a yakisoba bread from a cup yakisoba easily — just by putting some noodle in the cup onto a bread. For full disclosure, I knew that it was more metaphorical than literal, but that was the translation decision I made at the time and I don’t regret it. Thanks for taking the time to write out this whole explanation though.